Dimensions (HxWxD): 1.625" x .875" x .325"
This beautiful polished, untreated 1.625 inch Brilliant Blood Quartz Cabochon, weighing 12.792 grams, or 0.4 oz, comes from Tocantins State in Brazil. This Brilliant Blood Quartz Cabochon displays stunning clarity with vibrant flashes of gold and red coloration. 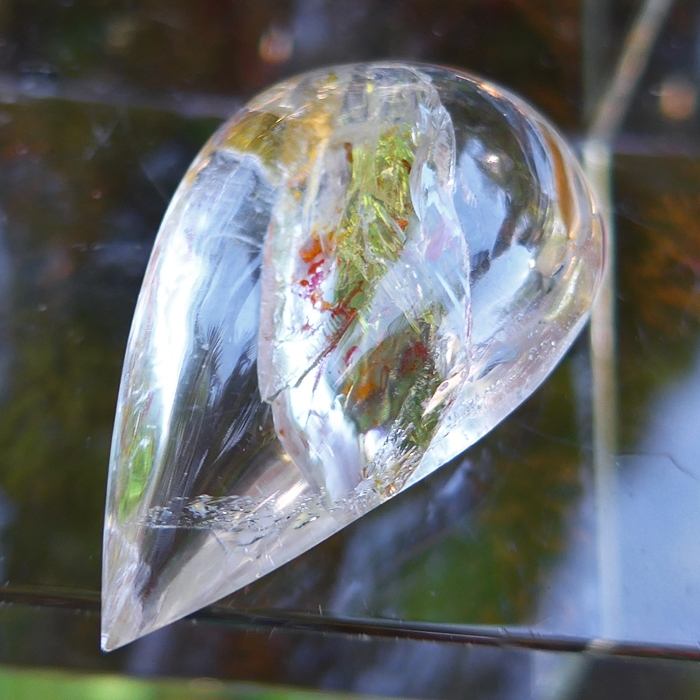 You can see the reddish-orange zones of color characteristic of the presence of hematite in this beautiful Brilliant Blood Quartz Cabochon, marking this unusual crystal as having a metaphysical connection with Archangel Michael. 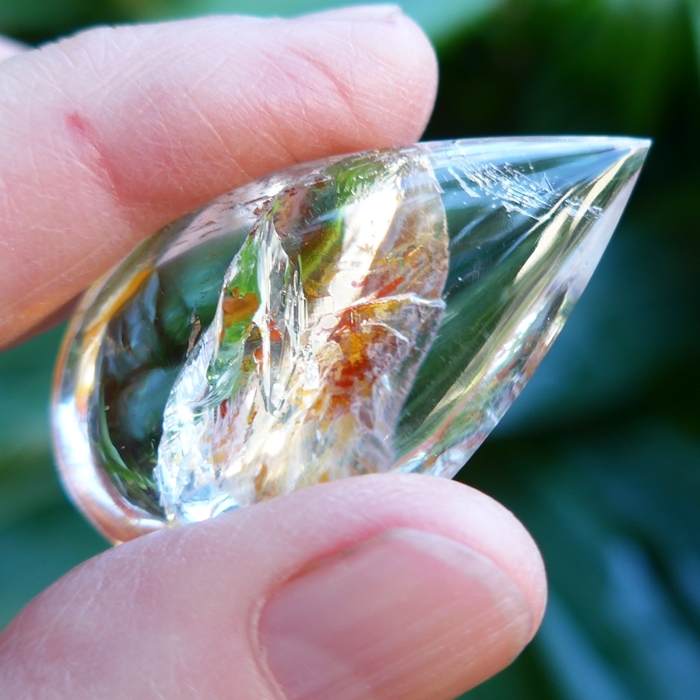 This remarkable teardrop shaped crystal is the perfect size to hold in your hand and for your medicine bag. 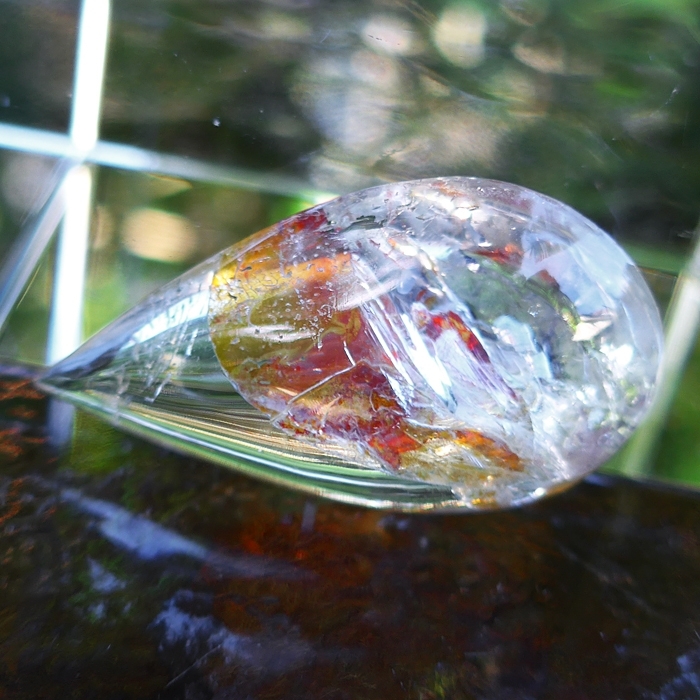 This powerful Hematoid Blood Quartz Flame Meditation Wand contains hematite, or iron oxide, giving it a distinctive golden-orange hue, and a distinctive metaphysical connection with Archangel Michael. Esoteric Christianity makes a link between hematite and Archangel Michael, and a quartz crystal containing hematite can provide the bearer with a powerful connection to Michael, providing access to the Archangel's loving wisdom and power to dissolve illusion through the activity of his famous sword, the sword of Ultimate Truth. During the Libran month, on October 7, 2017, in the northern hemisphere, the Draconid meteor showers will be visible. At this time of year, when sensational meteor showers, largely composed of iron, traditionally streak across the night sky, Esoteric Christian philosopher Rudolph Steiner’s clairvoyant vision saw the traditional flashing iron sword of Michael. Note: Weight above is shipping weight. Net weight is 12.792 gms or 0.45 ounces.